This cabinet organizer is constructed of aluminum making it rust free. It features a fold down table that is perfect for holding items such as wrenches or cleaners while working on that special project. The underside of the fold down table contains a rod for holding two rolls of paper towels. . 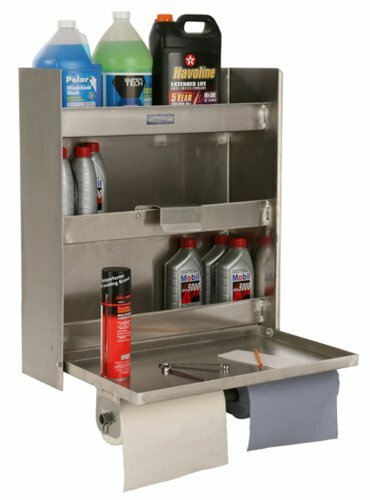 This cabinet also has 3 shelves for holding small bottles or cans up to gallon size containers. Ideal for keeping bottles in place, organized and securely stored. Cleans and mounts easily. Because this made of aluminum it can be easily drilled for securing to the wall of a garage, toy hauler trailers or where ever needed.